Like most of Guercino's landscapes, this quiet view was probably imaginary and most likely was made as an independent work of art. 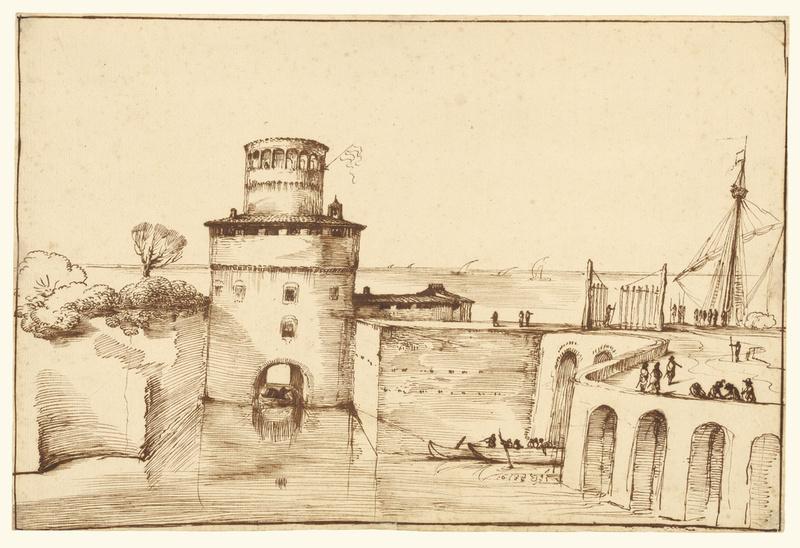 To create the effect of calmness, Guercino balanced forms and masses, as in the fort's tower and the docked ship's mast, which are anchored by the curving, arched wall and its smoooth, flat counterpart bounding the glassy sea. He added floating sailboats and sliding gondolas, the fluttering flag, and small figures at the port to enliven his scene. Brown ink was Guercino's favorite medium for drawing. Here his crisp, clean lines and spare, somewhat abstract, architectural shapes give this drawing a feeling of modernity.